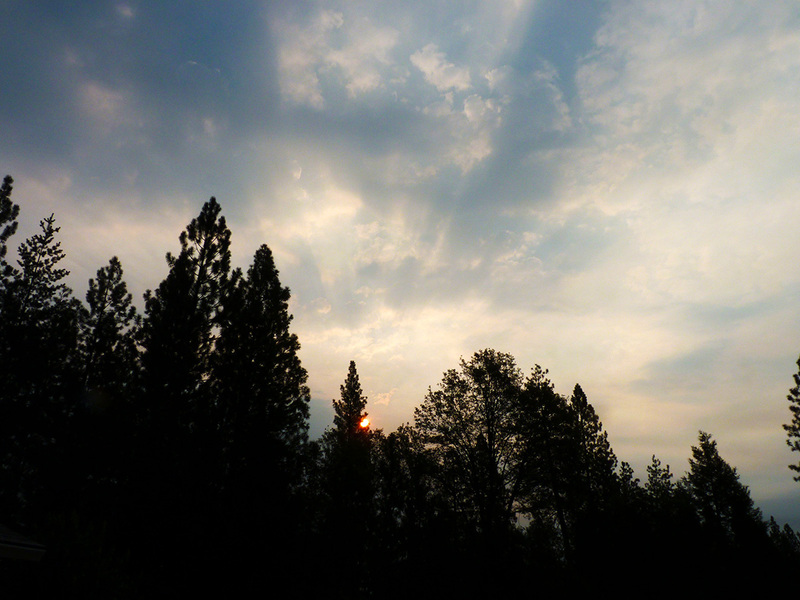 Just after sunrise on Saturday morning (9/28) I walked out on the deck to look at the crepuscular rays. 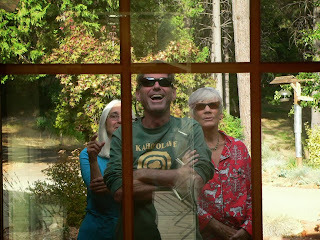 My brother-in-law Gary, who was visiting from Kauai with his wife Lynne, came out to see. We watched the light change and thought we could make out just the faintest hint of a 22 degree halo in the rays. Such a nice sight. 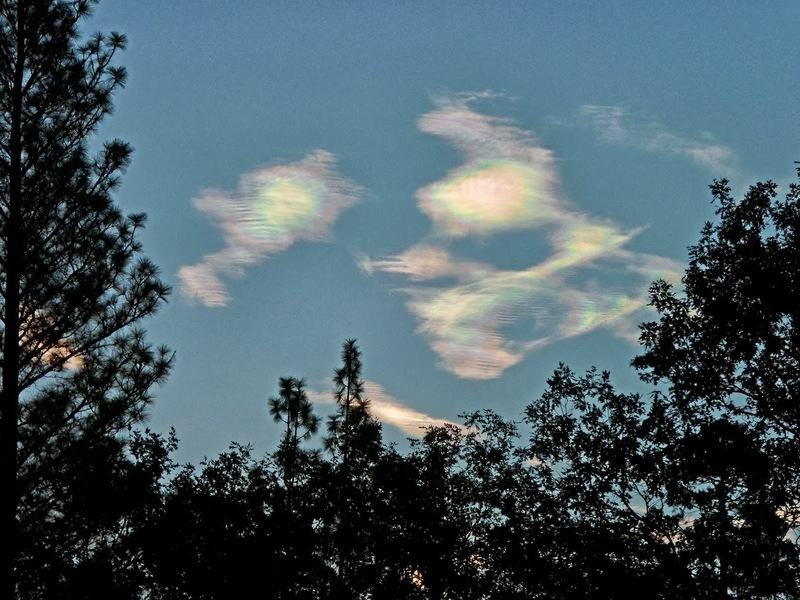 I told him and Lynne that the sky looked like it might produce some iridescent clouds. We were pretty happy about that. I've been wanting someone in the family to see this beautiful phenomenon. And then it happened. 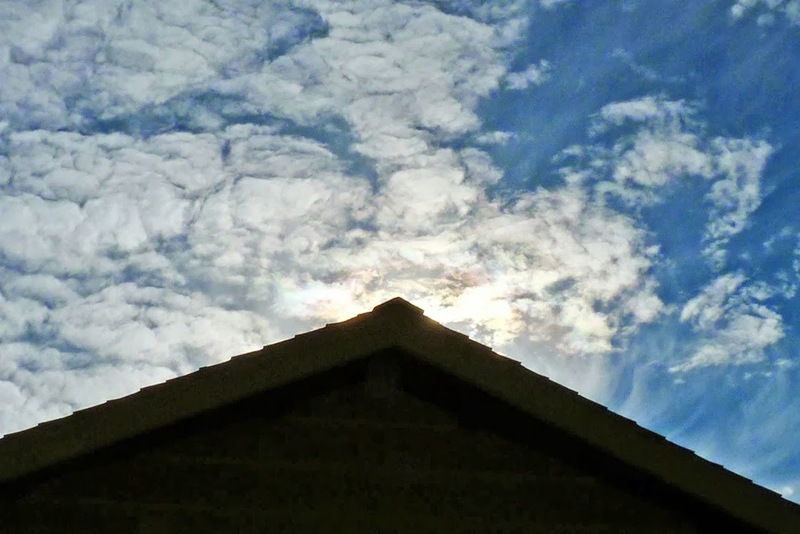 We had to go out in the front of the house and stand in the shadows to see the hints of color at the apex of the roof line, where the sun was completely blocked. The colors were changing so fast, going to pinks and greens, blues and lavender. It was wonderful. 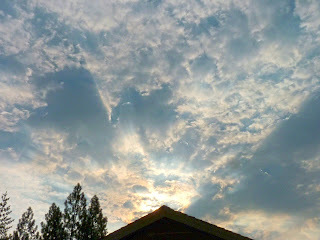 Roger took this pic of us watching the sky. It made me so happy to share this with them. A short while later Roger called me outside to see this. So lovely, like a portal into another world, we all agreed. 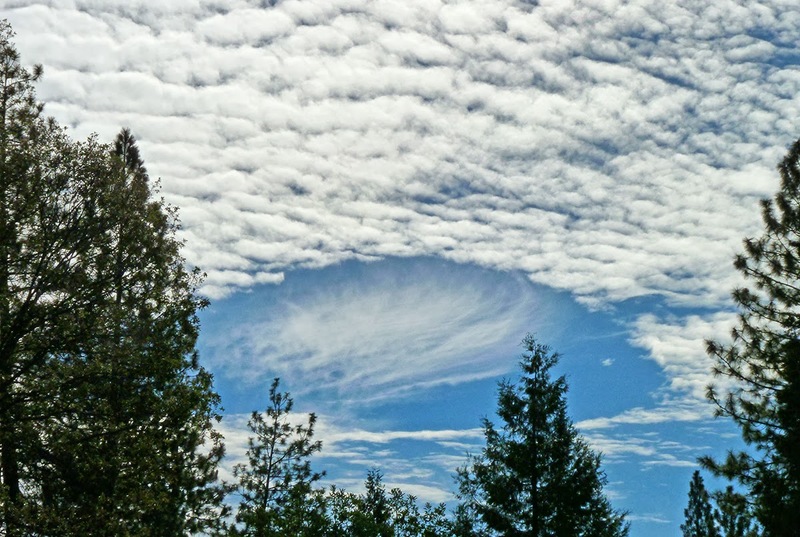 It was a "beam me up, scotty" moment. 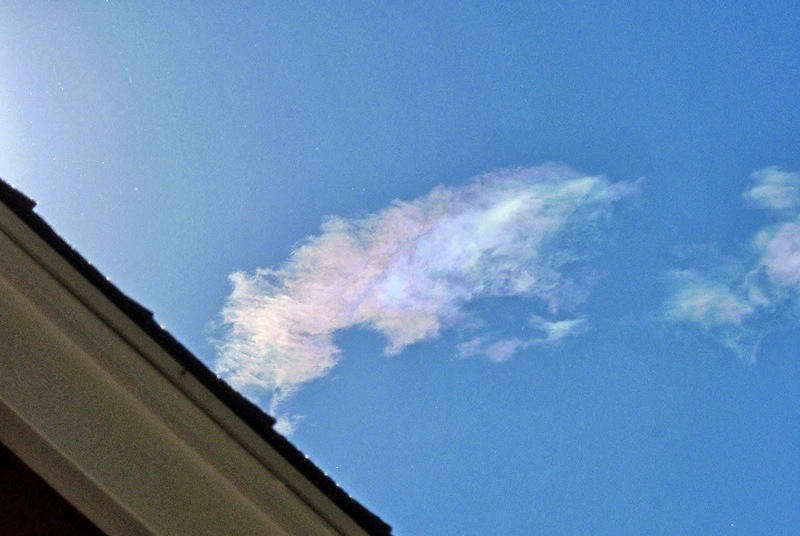 And then, the piece de resistance-- this iridescent cloud was as beautiful as I could have wished for. The really cool and interesting thing (to me, of course) is that this stunning display of deep hued colors comes almost three years to the day of this, the first iridescent cloud I ever photographed. I photographed these clouds on September 29, 2010. I called them sundogs, of course! Today is my mother's birthday, but I'm not allowed to tell you how old she is. She is keeping her age a secret from the "inmates" at the Assisted Living facility. She likes to keep them guessing. Mostly they guess her to be younger than she is. She loves that. It makes her very happy. My older brother who will be eligible for Medicare in November told me if I'm getting my nails and hair done as regularly as our mom does when I get to be her age, he'll be impressed. I laugh, I tell him, "I don't even do that now. I've never had my nails done, and I get my hair cut once every six months, if I remember." I must be older than she is already! I told my mother, if she tells her friends at the facility that her eldest son is going to be 65 soon, she'll have to tell them she had him when she was ten. We laugh and laugh. She likes to be young. It's good for her in every way. I was born old. It's true. It happens to some people. Here's a random story that illustrates my ancient qualities. When I started kindergarten I wrote a poem everyday and asked the teacher if I could read it to the class. She said "yes" everyday. One of my poems began like this: Now that I am old. 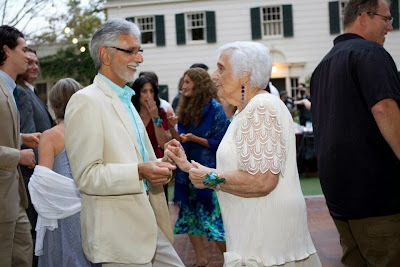 I absolutely love my mother's vitality and passion for life. She reads books on her Kindle. She checks her Facebook account on her laptop. She loves watching the Dodgers and the Clippers play. She loves to dance. She plays the Word Jumble every morning, and most of the time she guesses the words before I do. I think if she were to write a poem today, it might begin like this: I can't believe I'm still this young. Happy birthday to my amazing and inspiring mother. I know why Dad fell in love with you. I love you. 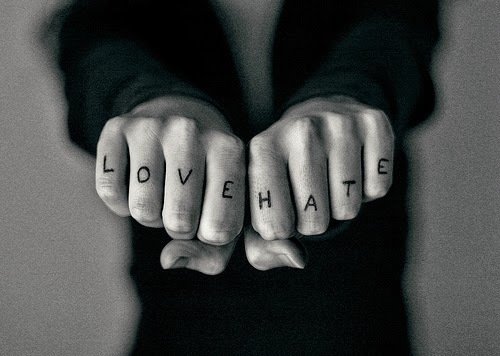 Robert Mitchum in the movie Night of the Hunter, playing a religious fanatic, had "love" and "hate" tattooed on his fingers, love on one hand and hate on the other. 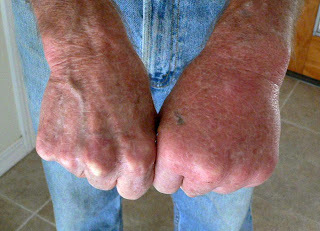 I have, temporarily, hands demonstrating "wasp-stung" and "not-wasp-stung" without any tattoo. This is the second time this summer that I have been stung by the more aggressive sort of paper wasp. The swelling goes away, well it did last time anyway, in a day or three. 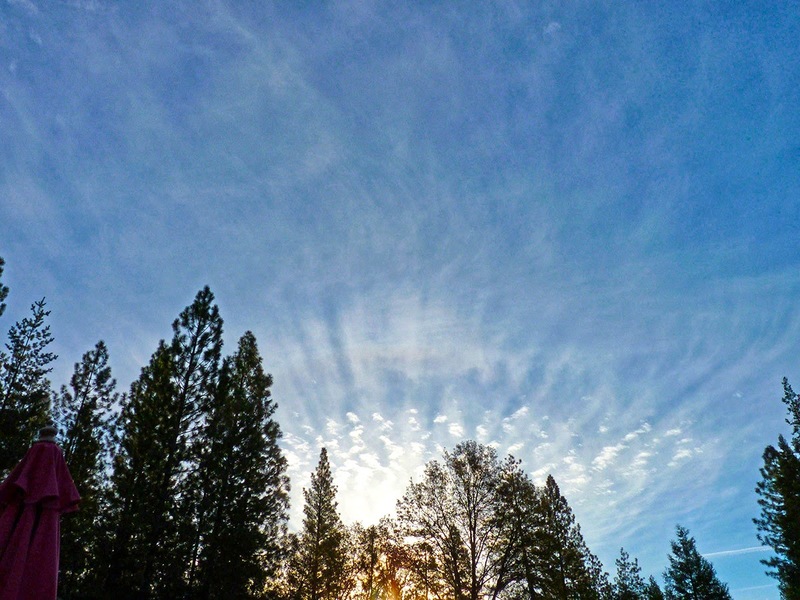 Back in the early 70s, maybe 71, I lived in Fortuna in Humboldt county in northern California. I moved there from San Francisco and had good friends to visit in the city. 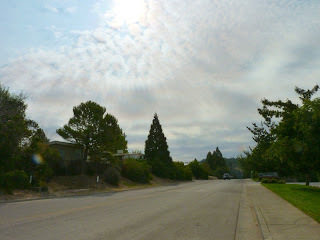 I would leave my house at 8 AM and hitchhike to SF, usually arriving in 6 or 7 hours. Almost as fast as if I had driven myself. After a few days I'd hitch back north. One of those trips found me somewhere a bit north of Ukiah at the end of one ride with my thumb out for another. In the way of things back then it wasn't long till a van pulled over, stopped about fifty feet away, and the rear door swung open. I trotted over and jumped from the bright sunlight into the dark back of a windowless van. No fewer than three voices welcomed me with "Hi Roger." Neighbors and friends from Humboldt. I was dropped off in Fortuna and enjoyed a leisurely 10 minute stroll home. 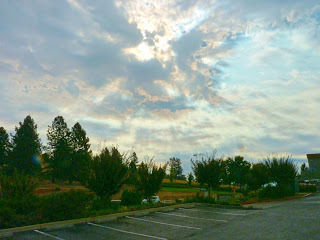 well, here we are the next morning, back in real time, not here in blog time. 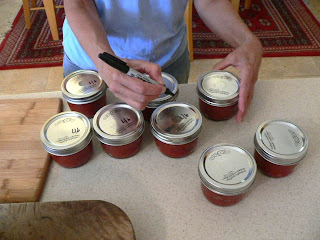 the sauce is now in a smaller pot and is chilled, ready to be put into jars. 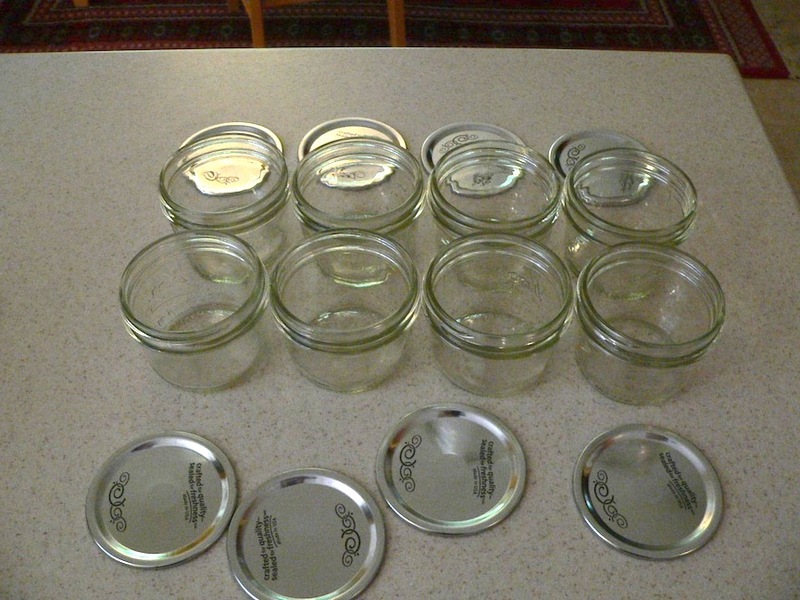 and here are the jars! half pints because there are usually just the two of us to cook for. our high tech metering system to ensure that each jar is filled just so. and the finished products. sauce and tomato chunks and pepper pieces. i'll add here a garden recap because we use blogger to keep a record of some parts our life. 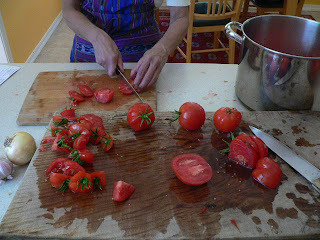 the tomatoes seemed to ripen a bit late considering the early heat spell we had, but they have come on quite nicely. the purple cherokees are pretty much done. we may get 3 or 4 more. some early girls and beefsteak are still ripening and we will have loads of green ones to ripen inside when the weather turns cold. there are many romas left. maybe we'll freeze some. our corn was delicious. we could have planted more. the bush beans only gave us about 4 meals. we planted 5 basil starts and all flowered very quickly. there were enough nice new leaves for daily use but mostly the leaves turned bitter. we didn't make any pesto this year. an early potato crop is tasty but has very thick skin. we tried a midsummer 2nd planting. the tops grew well and are just now fading. i've poked into the dirt a bit and found at least one large tater. the transplanted strawberries grew well but didn't produce many berries, though they were quite tasty. they have gone wild with runners and probably need thinning. aaah zucchini! the heat messed with it a bit but we have had fresh zukes all summer and have thrown away some monsters that seemed to grow huge overnight. there are about two dozen mature butternut squash of various sizes hardening for winter storage. the shade house was a slow start. we did eat a lot of kale, but the chard leaves got burnt a lot in the early heat. the kale finally got aphids and is gone. the chard pulled through and we have eaten quite a bit. after sowing carrot and beet and onion seeds in the outside beds more than once and having almost no plants come up (save the early beets mentioned below) i sowed some of each in the shade house and now we have all three coming along nicely. we harvested about 15 pounds of garlic in late june. the onion sets we planted last fall along with the garlic didn't do so well. we did harvest almost two dozen good onions but the majority fell to root rot and tiny worms. an early spring planting of beets gave us many nice meals. we grew mini red bell peppers, regular red peppers, red rocket hot peppers and jalapenos. they should have been staked. they all fell over and i have added straw mulch under them several times. they are prolific. we have been cooking with the bells and frozen some. i pickled some mini bells and i have made some tasty hot sauce with the red rockets and jalapenos. even though we have decided quite firmly to move next spring we ordered garlic for fall planting that will mature after we plan to leave. and we'll do onion transplants instead of sets. best laid plans "gang aft agley" and all that. we eat lots of tomatoes. 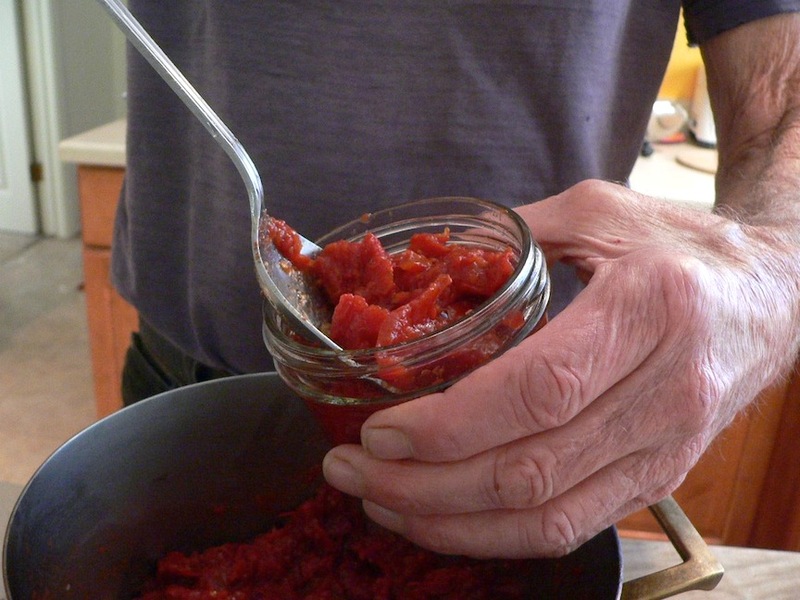 cooked tomatoes most of the year because the fresh ones available in stores aren't good raw. we like to grow them. 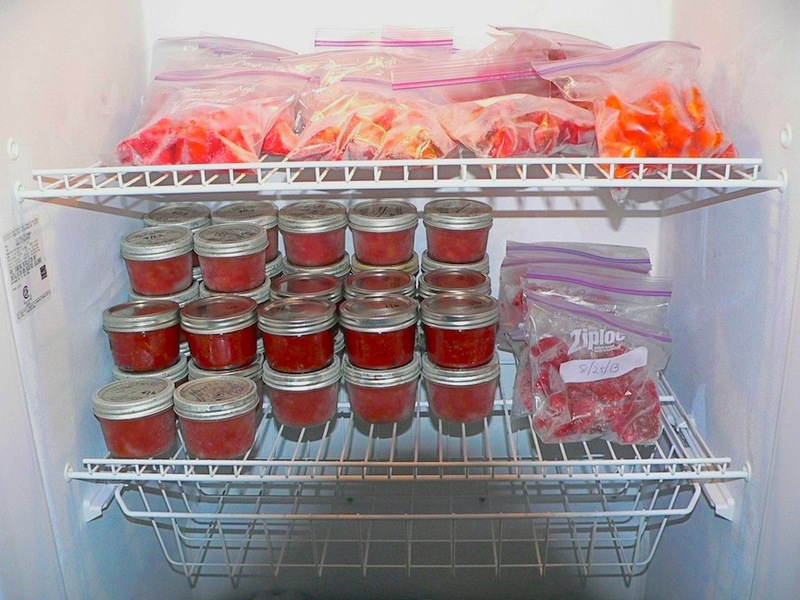 we enjoy fresh, vine-ripe tomatoes for about 4 months, so we make sauce and freeze it for the rest of the year. we also cut some tomatoes into quarters, freeze them on a cookie sheet, and put them in freezer bags. we do the same with whole golden cherry tomatoes. 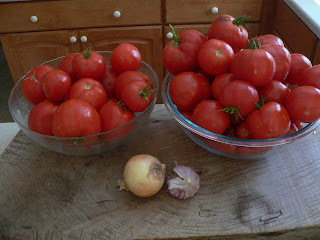 the ingredients: early girls, romas, and beefsteaks. the onion is store bought. the garlic is ours. two workstations: i stepped back to take the picture we rinse them in cold water and cut them meticulously into exactly equal pieces. 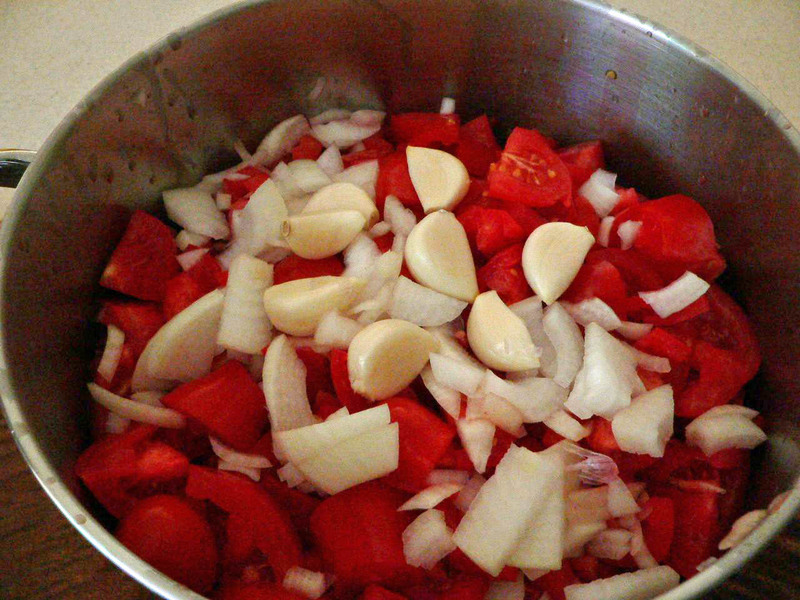 ready to simmer: the garlic will be put through a press. it looks better whole for a picture. 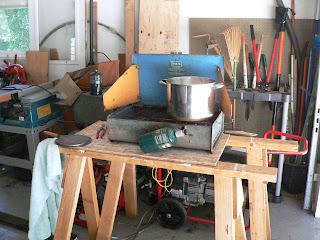 the summer kitchen: who wants simmering pot going all day in the house when it's 90 degrees? that is a sears campstove, maybe 50 years old. i found a nifty conversion thing so it runs on propane instead of liquid fuel. the sauce will reduce to about a third its beginning volume 5 or 6 hours. 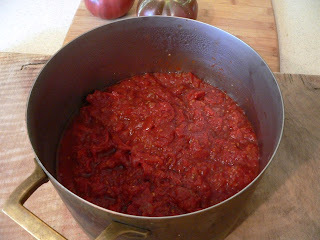 then we let it cool for a while and transfer it to a smaller pot and cool it overnight in the refrigerator. I wish I knew more about photography. That's actually an incorrect statement. I wish I knew something/anything about photography besides point and click. Yes, I have a good eye for beauty, but that doesn't give me any way to convincingly convey to you what the sky looked like on Sunday. It had crepuscular rays all day long, from sun up to sun down. From our backyard to the co-op parking lot to the highway. 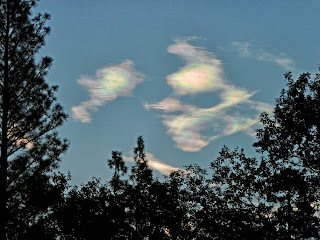 Crazy clouds that looked out of focus even before I pointed the camera at them. Crazy colors in mid-morning. Roger says I should learn how to do manual focus and F stop stuff. I say, what? My brain is on overload all the time as it is. Put more stuff up there? No way. So, this is what you get. 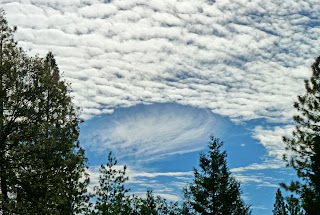 It really looked like this, but who would believe me?